The Spitfires kicked off 2013 at home in perfect style with a dominant 5-0 win over Billericay Town at the Silverlake Stadium this evening. With the disruption of postponed games in December and a run of five league defeats that saw Eastleigh plummet to the wrong end of the Blue Square Bet South table in recent weeks, it was imperative that Richard Hill's side came back with a response. 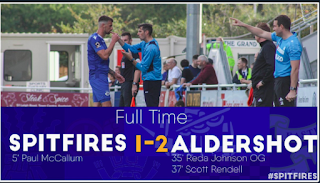 Hill and his players could not have answered their critics more emphatically after a near-faultless performance which included five goals to boost the goal difference, a fully deserved clean sheet and the all important three points to cap a fine nights work. Earlier in the day the club announced two new signings. Dean Beckwith joined the club on a deal which runs until the end of next season from Luton Town, whilst fellow centre half Alex Lacey penned a one-month loan with Eastleigh (also arriving from Luton of the Conference Premier). Both of the new additions started tonight's game and put in strong performances at the heart of the defence. From the first whistle, Eastleigh pushed forward. Michael Green attacked the flank high up the pitch to cross from the left, from which the first goal of the game came as early as the eighth minute. Green's cross was headed behind for an Eastleigh corner and DEAN BECKWITH was on hand to nod home a debut goal from close range, handing the Spitfires a welcome early lead. After opening the scoring, Eastleigh forced consecutive corners in quick succession. It was to be a theme that was repeated regularly throughout the game. The goal scorer Beckwith threatened in the air again as goalkeeper Sam Beasant had to deal with the aerial presence to concede another set piece. This time a drilled corner by captain Glen Southam found Mark Hughes on the edge of the area, but the midfielder's shot was blocked well. 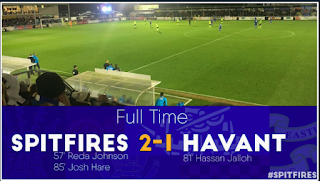 In the 17th minute, Eastleigh launched a quick counter attack with Jai Reason carrying the ball forward before allowing youngster Corey King (who was handed a rare start for the first team having impressed in recent weeks in the reserves), to take over down the right. King, who did his chances of staking a claim for a regular place in the side no harm whatsoever; with a positive attacking display by hugging the touchline and attacking the full back time and again; played a square ball for Craig McAllister - who in turn shot just over the bar. On the half hour, another flowing move saw the hosts conjure up another opportunity following good interplay between Michael Green, Damian Scannell and Jai Reason down the left hand side. Scannell played a one-two with Reason and then poked a shot towards goal that was just off target. Just two minutes later, Eastleigh doubled their advantage. DAMIAN SCANNELL took the Billericay defence apart with a good run where the former Southend United winger was picked out perfectly by McAlllister. Scannell then side-stepped the keeper before firing the ball in to the back of the net from the edge of the area with his left foot – a classy finish. Eastleigh showed no sign of weakness and looked comfortable for their 2-0 lead. Ten minutes before the break, Jai Reason let fly with a great hit from all of 30 yards. The fine attempt on the half volley flew narrowly wide. It wasn't until the 41st minute that Billericay had even the slightest sight at goal such was the defensive display and solidity of the Spitfires. A half chance fell the way of Billericay's Charlie Taylor, who shot on the turn to force a first save of the game out of Jack Dovey. The first half ended with a good ball in from Green having to be cleared away by the visitors in the six-yard box. At the break, Eastleigh looked good value for their lead with goals from Beckwith and Scannell giving their side a healthy two-goal cushion. Immediately after the restart, Eastleigh went on the front foot taking the game to Billericay in the opening stages of the second half. The Spitfires won an early corner straight away and soon after Jai Reason delivered an excellent ball in from right that was almost a cross disguised as a shot that evaded everyone in the centre and went just wide and behind for a goal kick. The skilful and pacey Corey King appeared to be growing in confidence as the game wore on and continued to impress. King worked space for a shot in the 47th minute where he drilled a low shot towards goal that had to be pushed away by Sam Beasant. Three minutes shy of the hour, Eastleigh won yet another corner kick. Reason's delivery was dangerous right across the face of goal where it just hit Corey King on the line and deflected behind off a Billericay defender..
Jay May then improvised with a shot on the turn but failed to trouble Jack Dovey, who was enjoying being back between the sticks having lost his place to the recently departed Ross Flitney. More pressure from Eastleigh and two more corners followed - it was beginning to be a case of one-way traffic. In the 67th minute Eastleigh found themselves three goals to the good as DAMIAN SCANNELL's delivery from the near touchline somehow found its way into the goal with a little help from the opposing goalkeeper. Just as Eastleigh were beginning to hit their stride, referee Mark Pottage pulled up with an injury and was left in need of treatment for cramp by Eastleigh physio Andy Cook. A lengthy delay in play ensued as a replacement official was sought and found before the game could resume. After a spell of inactivity due to the unforeseen incident, Eastleigh continued where they left off and went on to finish the game in style by adding two more goals. In the 79th minute, a superb cross from the left by Glen Southam was met by a glancing header from Corey King. King's effort brought out the best in Beasant who managed to deny Eastleigh a fourth goal diving at full stretch. With nine minutes of normal time remaining, DAMIAN SCANNELL claimed a hat trick by getting on the end of Jai Reason's cheeky back flick through the legs of a defender. Reason's industry and skill was something to behold to provide the assist for Scannell. Reason was the driving force behind Eastleigh's attacking play as so often has been the case this season. Scannell was in the right place to stroke the ball home and kill the game off. 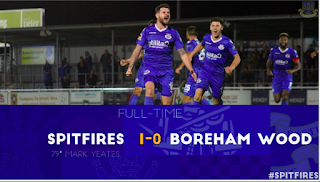 The Spitfires were enjoying themselves despite the rain on this Tuesday evening and could have been awarded a penalty moments later as King's pace saw him tripped in the area after Reason's through ball. The replacement referee ignored the strong claims of a foul from the hosts. Eastleigh came close once more when Reason saw an effort from inside the area deflected narrowly behind for a corner. As expected due to the earlier break in play when the referee unfortunately had to leave the field with an injury, eight additional minutes of stoppage time were added on at the end of the ninety. Richard Hill's side showed no signs of resting on their laurels and continued to attack until the final whistle. Play-maker Reason played Scannell through on goal where only a fantastic challenge by Rob Swaine could prevent Scannell from getting a shot away. Three minutes into injury time, MARK HUGHES popped up in the box to score his first goal for Eastleigh. Reason rolled the ball across goal from the right and Hughes was on hand to steer the ball past the keeper to score Eastleigh's fifth and final goal of a dominant team performance. Billericay had the ball in the back of the net very late in the game but a foul was rightly given for a push on Dovey, who managed to hold on to a precious clean sheet aided by the defence in front of him who were very rarely troubled. This performance and victory was impressive and much needed. The Spitfires have the chance to make it back to back home wins with a game against Boreham Wood on Saturday at the Silverlake Stadium.